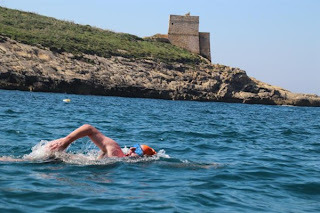 Addictive this long distance swimming lark......A friend of mine had encouraged me to go to the Swimtrek Gozo week early in the season to help with focus for the year ahead. I had even had 3 lessons with the great Ray Gibbs at Swim Canary Wharf in the run up to this after experiencing Rotator Cuff pain in the 2011 summer season. 'You are not going to believe this Ray, but the last time you saw me I could only swim 25 lengths but last year I swam Winderemere'....he was thrilled to take me apart in the pool with his cameras! After a sensible early night and no booze like a good boy, the acclimatisation swim started at 7.30am where we were told to swim to the other harbour wall and back twice. I got out with 5 other pairs of flip flops/Crocks still left on the wall (out of 14) and was presented with an orange coloured swim cap (others got orange, pinks or yellows). What was to happen for the next 3 days was almost an army-like drill of seminars on various topics, swims we had no knowledge how long we were doing and eating (as much as possible which is fine by me). The first real swim of the day was a 1 hour round a 450m circuit of the bay where I think I completed 6 or 7 laps. The water was beautifully clear compared with (and a welcome relief from) the ghastliness of Dover harbour. The only difference was that we could now see some of the jellyfish that were around - predominantly Mauve Stingers (http://en.wikipedia.org/wiki/Pelagia_noctiluca) but 1 in every 10 the guides were plucking out was a Portuguese Man of War (http://en.wikipedia.org/wiki/Portuguese_Man_o'_War). How nice.......Difficult to find the perfect stretch of water after all (Paradise doesn't exist!!)..... I plodded around and 2 of the lads who were more used to tearing around in wetsuits seemed to 'man-up' (probably from peer pressure from the rest) and dropped the wetsuits for this first one. After this hour, it was quite clear from the shivering, however, who was going to feel the cold more than the others for the rest of the long swims ahead. One of the faster guys with no fat on him and the 2 normally wetsuit-clad lads both came out a slightly whiter colour than the rest of us carrying a bit more. The temperature of the water was in the parish of 13-15 degrees. 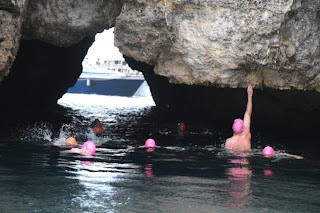 In the afternoon, we did a 2 hour swim in the same bay and had our first feed after 1 hour of the maxim concoction that Nick Adams is famous for. This length of time seemed to put more cold water training to the test and a couple of the guys were really worse for wear due to cold. I recall focusing on being smooth and had the recent BMW video of Addlington on my DVD player that I had watched in my room about 10 times (http://www.youtube.com/watch?v=PuJo_lVmO1Q). The only difference is that she is 10x faster....with one arm.. I continued the cold water immersion training for Loch Lomond when I got back to the room with a cold shower.....why am I doing this, what am I doing here?? I remember after another seminar going to Supper and feeling stiff. Mark Bayliss calmed me down by noting that in the first hour tomorrow I would get to relax the muscles again though exercise. He was right. I went to bed feeling physically tired, enjoying the vibe and generally forgetting that I had a 'normal' life outside of this cocoon (gotta love escapism!). After an enormous breakfast of muesli, toast, fruit and yoghurts (washed down with the rankest machine coffee known to mankind), we got into a minibus that seemed to have been around in the 1950s to take us to the magical bay of Mgarr ix-Xini (http://en.wikipedia.org/wiki/M%C4%A1arr_ix-Xini). At 10.45am we entered the water and weren't due out until 4.45pm (nice day out!). Laps of the short course, washed down with laps of long course (out to pole at the edge of bay ) then back for more punishment of the short course 450m loop. I was really looking forward to this and trying to find that swimming Nirvana & Zen heaven from the year before that I experienced at various junctures. Set off slowly and found my stroke (tried to ignore absolutely everyone else completely...). Plodded around for the first 2 hours then hit a really tricky patch between hours 2 and 3 where I wasn't even half way. Oh dear...hitting a brick wall Sheridan? To get through this I thought again and again of my charity, the Rainbow Trust, the moving DVD that they had sent me of the poor lad Josh James who died recently of terminal cancer and how much this road was going to help me raise money for lads like him, his brave mother and his lovely sister. That DVD moved me so much inside that this was an insignificant swim compared with the pain that family had endured.... I was soon back in the zone and back onto my mission now. After 3 hours, I settled in, my mind got close to vacant (nothing new there) and I was back on the swimmers high. I knew this swim would get knocked out. 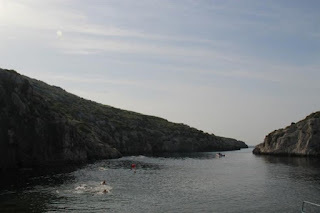 The water was stunning and during hours 3 & 4, the longer loop out to the pole at the far end of the bay by the open ocean meant a chance to swim near schools of fish of different varieties. It was just clear, pure and fresh. During the day, the guides had plucked out the multitude of jellies and the water felt fine. After 4.5 hours, they gave a couple of us a top up feed from the boat to practise feeding from that mode of transport and gave a chance for the more muscular of the group to take on more fluids.....A few more loops of the shorter course and we were close to done. As we approached 6 hours, I really didn't want to get out and wanted to keep going. The cliffs, the nature and the whole experience became more and more intense. The shoulders felt stiff but I was relieved that the stroke had held up and there was no real rotator pain from the year before. We got out of the water to raucous applause of the patrons who were hitting the bars in front of us who were obviously made aware (by the guides) which screws we had loose and what we were up to. After getting out of the water, one of the lads who was down for a massage at 5pm wasn't in a real state to turn up so I even went forward in the massage queue - the importance of having an insulation layer! As a group, we had achieved something remarkable. 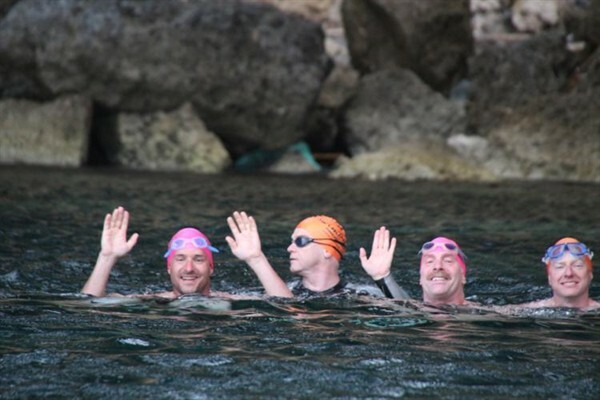 All of us had finished the 6 hour swim. No-one had given up (that hadn't happend on these weeks before apparently). Even the members with no swim or goals booked that year didn't flinch. That was some feat. A couple of the lads and a lady completed it in a wetsuit and I think (in fact I know) they had a renewed respect for the rest of us who were in cossie only. I felt a new level of admiration for the mental strength of my co-swimmers and no-one bottled it. I was particularly chuffed for Alex who complete the 6 hours where the year before could only manage 1 hour - this must have opened up a whole new world to her. I rewarded myself with a cold shower (ever mindful of Loch Lomond) to rinse down and got myself up to the massage table. How arduous! A phrase I will take from Nick Adams with me on future adventures after this experience is 'Man-up'. We had all 'Manned-up' when it counted. 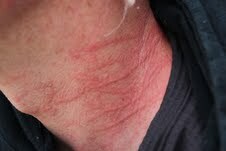 I then felt sorry for the group the following week who would get some stick as the benchmark had been put in the sand. The main 3 days of back to back swimming was over and the rest of the 'holiday' comprised of fun swims and more seminars. We went over to Comino to swim the blue lagoon. I even noted that Superman Mark Bayliss had a chink in his armour plating on the boat ride over to the island as he admitted he can suffer from sea sickness. We all have our weaknesses. We swam through an amazing cave and around the blue lagoon. Dodged untold jellies until getting back on the boat. This was the only time of the week where the water felt warmer than the air temperature! At dinner on the last night we all received our certificates and Nick Adams did a terrific job of presenting them with a little sum-up speech about all of us in turn. I think mine was along the lines of quiet, thoughtful and always upbeat & especially so when others were at the most difficult moments. Felt a sense of pride and achievement & couldn't think of a nicer way to kick off the season! Clive, Thomas and I stayed on an extra night when the others had already gone home and being partial to the fine food, we went in search of a Lobster to wash down with a proper bottle of white Burgundy to celebrate completing the week. We tracked down a dish called Spaghetti lobster that had made it all the way from........Scotland!